- Extremely easy general configuration if you only use the main controls : direct access to seven sound presets, reverb and chorus on/off, etc. It starts getting more complicated if you want to control more things because advanced functions are not very user friendly. Why are the advanced functions not labeled on the buttons? To solve this problem you'll have to label them yourself with tape. It would also be nice to know what you're doing on an LCD display. - Very easy installation on a PC with generic drivers (the keyboard is automatically detected by Windows). Installing the drivers provided results in more editing possibilities. - The PDF user's manual is very short but clear. I've been owning it for a few weeks and I use it every day. Cons: advanced editing i not user friendly. MIDI sounds are quite bad, except for the seven "high-quality" sound presets that you can use in case of urgency. Pros: audio inputs with comprehensive connections and rather good mic preamp (I thought it would sound awful). Other pros: light weight and compact size. I tested many other models that didn't match my needs: either a simple master keyboard without standalone operation (useless when I travel without my rack) or much more expensive digital pianos and synths without comprehensive audio/USB interface. As a summary, I consider it an all-round tool even if I prefer to use virtual synths (Timidity++) that sound much better. the config is basic and simple to use one branch we play point. concert pianist and former piano salesman, I Fallais a MIDI keyboard to play with no place to host an acoustic piano. At the time of my purchase I was very limited in terms of budget and I could not exceed 300 euro, which has seriously reduced my choix.J 'so I choose without trying it on that prokey sono.Sachan nothing beats a real piano touch for the same or digital piano keyboards very high quality, I wanted an instrument to play every day. I use it on stage and coupled to a laptop i 2.4 mghz core 5a (600 euro). The prokey walk very well use in home studio and on stage. easy to transport and install, connecticque asser complete, internal sound card of good quality but I have to change an m audio externe.Coter soninterne supplied with the keyboard you forget they are crap. The keyboard responds well whatever keys move a little sideways. it remains a weighted keyboard and not heavy. Overall I'm happy I will change the keyboard for a studiologicvmk 188 for a heavy touch now that I Aiun little over average. A keyboard and a sound card is really convenient for the stage and space saving. I tested the touch. Stop comparing the incomparable! This is a synthesizer MIDI Keyboard Controller not a digital piano-_-! Touch to a synthesizer is really nice though biensur is not touched a digital piano. I did not but compare it to RD300sx seem to me very unlikely. 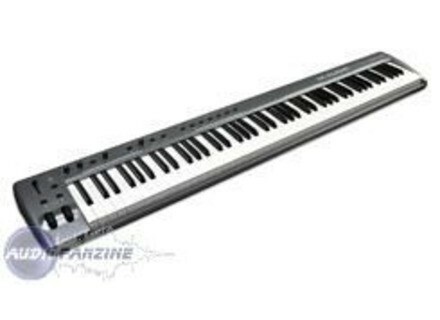 Where do you get the relationship between a master MIDI keyboard and a digital piano 300euro to 1300? The comparison would be to compare an electric guitar and an acoustic guitar for the same purpose). Indeed, the utility is absolutely not the same! The built-in sounds, I did not test but if they are not well, remember that the goal is to import sounds: This is a midi keyboard! So this keyboard is for the person who uses several types of sounds and not seeking a touch of piano. Also, if you own the software Pianoteq, the printing on the keyboard will change a lot! I received in about a week and I re-file a notice after having actually tested.